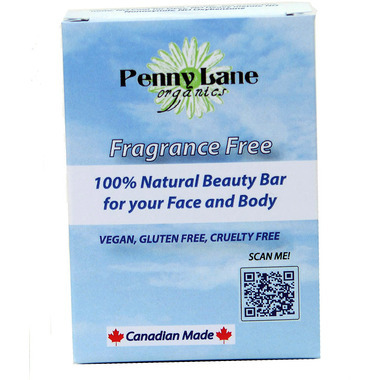 Penny Lane Organics 100% Natural Beauty Bar is fragrance free and chemical free and is gentle enough to use on even the most sensitive skin. Usage: Lather and rinse well. Keep away from eyes. Ingredients: Saponified Olive Oil (Sodium olivate), Coconut Oil (Sodium Cocoate), Sunflower Oil (Sodium Sunflowerate), Shea Butter (Butyrospermum Parkii), Water (Aqua).